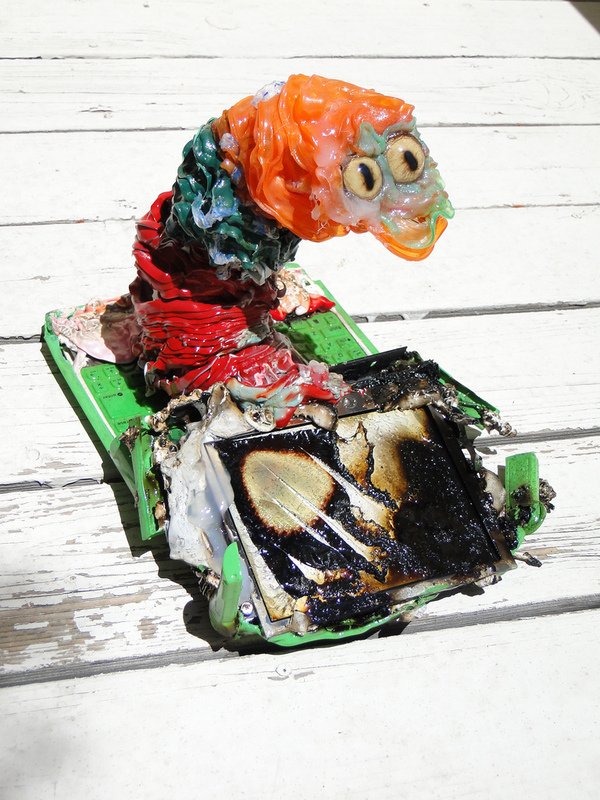 Continuing the previous rant about plastic toys, children, and madness, allow me to present to you the “work” of one Kenny Irwin. Kenny Irwin art comes in many unique forms from using bic ball point pens to draw with to weaving xmas lights into textiles to microwaving everyday retail products into other worldly creatures and building giant robots out of your junk and much much more. Kenny Irwin art is endorsed and featured by AVAM and is the talk of the town and the talk of the world. Owning a Kenny Irwin original means owning something everyone talks about. From the internationally renowned dOvetastic Microwave Theater comes this state of the “art” work of art worthy of a place in the Guggenheim Museum sign and dated by Artist Kenny Irwin. Comes with free stylish display stand. Your item is guaranteed to have been microwaved or your money back. Remember, microwaving food is for morons. Price is non-negotiable. While I’m not quite sure which world this man lives in or what imaginary town he’s the talk of, I, personally, am most certainly a fan of recycling and refunctioning redundant and otherwise derelict pieces of everyday consumerism. I hate wastage. What boggles the mind, however, is that not only does this individual take (presumably working) cellphones, gaming consoles, XO-1 laptops and whatever else could prove entertaining, interesting, or symbolic, shoves them into a monster of a microwave oven, films the entire destructive process (“don’t try this at home, kids”), then sticks a few beady eyes and what have you onto what remains, and sells it off. Devoted readers of this blog may have gathered that I’ve begun collecting (old) laptops for a variety of (as-yet unspecified) projects, and those who actually know me would also be aware that I detest throwing out functional equipment just because it’s “old”. It may even come as a surprise that I’m about as charitable as the next guy. Granted, the laptop is some ten years old. And I got it for free. But ten years ago I’d have killed for a laptop like that. This little machine would’ve outperformed the hardware my precious old BBS (which was still online ten years ago) was running on. 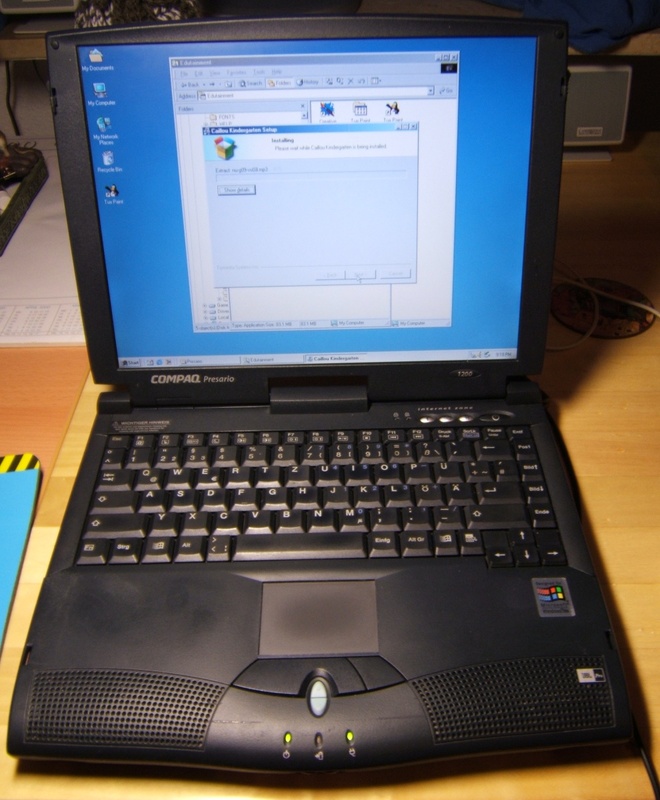 This little Compaq Presario 1200 (model no. 12XL408A with a 700MHz Celeron Coppermine, 128MB RAM, 10GB 4200RPM Hitachi DK23BA-10 HDD, 1.44MB floppy, 24x Toshiba XM7002BC CD-ROM, and JBL speakers) quite merrily ran a botched installation of Win2k when I got it. It handled a test installation of an old version of PuppyLinux with aplomb, and it now chugs along on good/bad ol’ WinME to excite, entertain, educate and teach one young kid the co-ordination, reading, writing and puzzle-solving skills he’ll need to compete in a world still dominated by those who grew up on Pong. And ten years ago I was more than three times as old as its new owner. 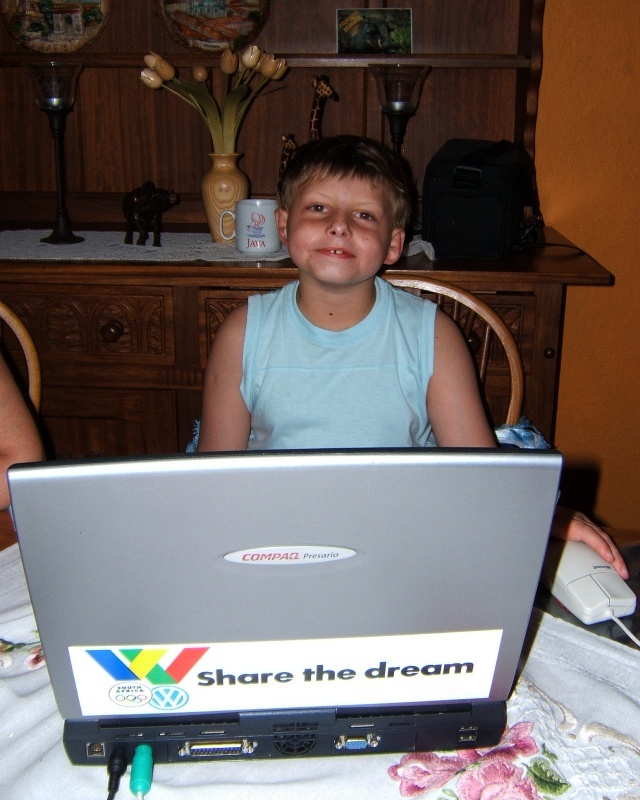 This entry was posted in Technology and tagged art, gadgetry, junk, laptop. Bookmark the permalink.